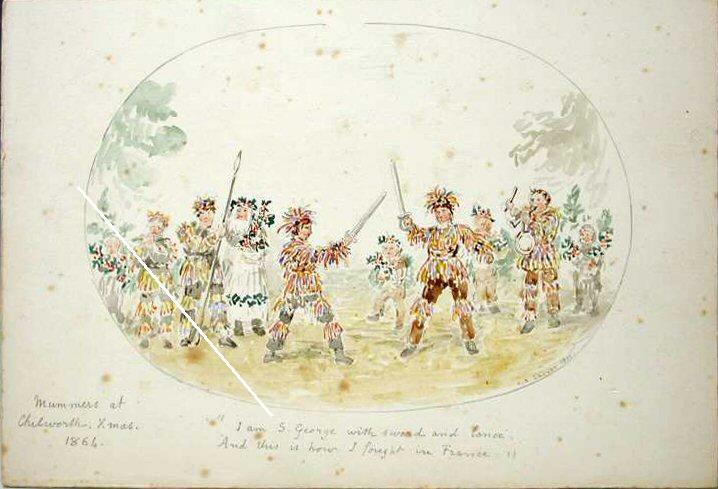 In June 2008, a pair of watercolours came up for auction, showing customs at Chilworth, Hampshire, England in 1864 - Christmas Mummers and Mayday Garlands. These were acquired, appropriately, by the Willis Fleming Historical Trust, which safeguards the heritage of the family who owned Chilworth Manor and the Chilworth estate. Both pictures are about 7 inches by 5 inches, painted in oval vignettes, with pencil captions at the bottom left, and quotations bottom centre. Both captions give the year 1864, but the edges of the vignettes are signed "A.D.Lucas, 1900". The auction lot heading for the pictures attributed them to Chilworth Manor, although there is no evidence to back this up. The captions of both pictures mention just Chilworth, which is less specific. In this article, I will concentrate on the picture of the Mummers (shown below), discussing the authenticity of its subject matter, investigating the artist, and considering the difference in the dates. Mummers at Chilworth. Xmas. 1864. And this is how I fought in France"
This picture shows a group of ten Mummers in ribbon or streamer costumes with hats. Their faces are fully visible. Three or more appear to be carrying sprigs of holly with berries. One of these, is dressed in white, and has a long white beard. He is evidently Father Christmas. Two figures in the centre are fighting with swords, and another figure is holding a spear or lance. Two figures are playing musical instruments – a flute or fife, and a pipe and tabor. A third figure is holding something vaguely circular. It possibly could be a drum or a bag of some sort. The folk plays of Hampshire are well documented thanks to the work of Roud & Marsh (1980). Their comprehensive list does not include Chilworth, so it is therefore a new discovery. A number of nearby villages are listed, however, of which one of the more relevant is Romsey, this being the post town for Chilworth. There is no mention of headgear, but otherwise this pretty well describes the costumes in the painting. The bands of ribbons tied around the legs are particularly clear in the painting, although the method of attachment on the upper body is less obvious. All the actors are pictured wearing something on their heads, and two styles are apparent. Some have hats covered in ribbons that bear some relation to the ribbon and streamer-covered hats worn elsewhere Hampshire, such as at Overton, Longparish and Netley Abbey (see for instance: Cass & Roud, 2002). The difference is that the length of the ribbons is restrained, while at Overton and Longparish the streamers hang in front of the face with the deliberate intent of hiding the identities of the wearers. No facial disguise is evident in the painting, but this is not a problem. Some Hampshire Mummers, such as those at Netley Abbey, did not cover or colour their faces either. The second style of headgear consists of green holly wreaths with red berries. These are worn my three figures. The pipe and tabor player also seems to be wearing a wreath of leaves, but not holly. The character shown in close-up on the right wears a costume that is different to all the other characters. In addition to his holly crown, he has a long white leaf-trimmed robe and sports a long white beard. These mark him out as Father Christmas in the old Victorian mould, the only character in the painting who can be named with any certainty. The Romsey script has the characters: Father Christmas, St. George, Turkish Knight, Doctor, Cut & Star, Poor & Mean, Bold Slasher, Twing Twang, and Jolly Jack - that is nine characters in total, compared with the picture's ten. Five of these are supernumerary characters appearing in turn at the end of the play, but not adding to the plot. These bit parts generally tended to be given to newcomers or younger members of a group. According to this, St. George should have both a sword and spear, but he is unlikely to be able to fight with both, so he may have handed it to another actor to hold for him. This makes the left hand fighter more likely to be St. George. The other major character in the play is the Doctor, who is brought on to cure the vanquished Turk. It is not apparent who this might be in the painting. Presumably he would not be one of the musicians. Perhaps he is the character in the background holding the mysterious round object. The pipe and tabor player is worth a closer look (see left) because pictures of such instrumentalists are uncommon from this era. This combined instrument consists of a three-hole pipe (which has a range of just over an octave) played with one hand, and drum played with the other. The pipe tends to be held in the left hand, as shown here, and the drum is either a side drum slung low from the crook of the left elbow, or a shallow tabor suspended higher from the left wrist, as in this case. This portrayal is a little odd, however. The pipe would normally be held towards the far end rather than in the middle, and its barrel is more flared than one would expect. (Some tabor pipes are made with a slight external flare, although the internal bore is cylindrical.) The portrayal is more in keeping with a brass instrument such as a horn with a bell end. There is also a suspicion that the tabor may in fact be a cooking pan. This combination might still be musical, but it would be more calculated for making a racket. On the other hand, there is a fife player on the other side of the picture which favours the musical option. One must also make allowance for artistic license. An interesting thing about these musicians is that they appear to be playing while the fight is taking place. This is unusual in English folk plays, but fife and drum music is played during the fight scenes by the Mummies of St.Kitts and Nevis in the Caribbean, whose play is drawn from the English tradition (McMurray, 2004). The picture could show a similar performance. Alternatively, it could indicate that the group had posed for the artist. I will come back to this shortly. 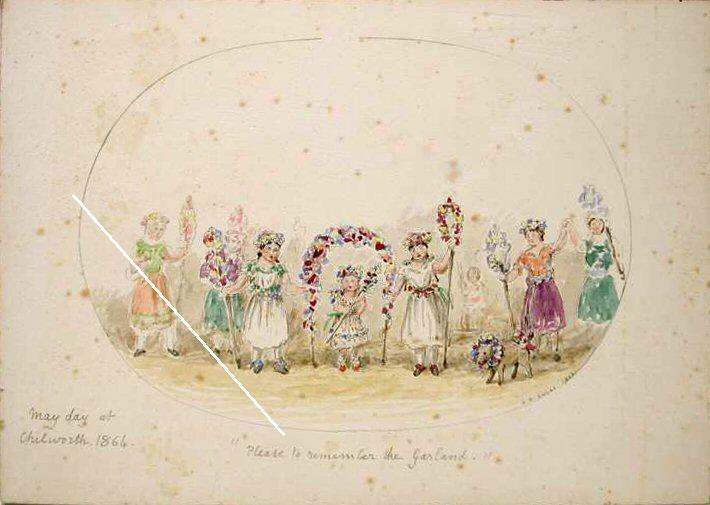 The other painting in the pair shows seven girls (and a dog) with May Garlands, with the captions "May day at Chilworth 1864" and "Please to remember the Garland.". Like the Mummers' painting, it is signed "A.D.Lucas, 1900". May day at Chilworth. 1864. "Please to remember the Garland"
As this website is dedicated to folk drama, and I am not a specialist in Mayday customs, I will not attempt to analyse this picture, but leave this for someone better qualified. Suffice to say that the scene it portrays is typical of a custom that was widely distributed throughout southern England in the 19th and early 20th centuries. To anyone who would like to find out more, I recommend Jacqueline Simpson & Steve Roud's Dictionary of English Folklore (2000), and Roy Judge's May Day in England: An Introductory Bibliography (1988). Albert Dürer Lucas was the son of the noted sculptor Richard Cockle Lucas. Naming his son Albert Dürer after the famous German engraver could have been a burden on the little boy - perhaps his father nurtured hopes of him being a chip off the old block - but evidently he rose to the challenge. He eventually gained a reputation in his own right for still life paintings, especially of flowers, insects and other subjects from nature. Although the Lucas family made their home at Chilworth, north of Southampton, they originally came from elsewhere. Richard Cockle Lucas was born in Salisbury, Wiltshire in 1800. He was apprenticed to a cutler, a relative, in Winchester, Hampshire, where his ability at carving knife handles revealed his skill as a sculptor. He moved to London, aged 21, and studied at the Royal Academy Schools. His son Albert Dürer was born in 1828 in either Bayswater or Paddington. (Census returns vary on this, but the two places are adjacent.) In 1846 the family was living at Nottingham Place in central London. They moved out of London in 1849, probably for health reasons, first to Otterbourne, near Winchester, and then to Chilworth near Romsey about 1854 where R.C.Lucas had the "Tower of the Winds" built to his own design. He sold the lease to this house in 1861, but may have lived there longer. It later burned down. He then built a second Chilworth Tower about half a mile from the first in 1865. (H.Willis Fleming, personal communication). When Albert married, he lived next door to this house. Chilworth Tower mark II was sold on Richard Cockle's death in 1883. Albert sold his house too, to the same purchaser, in 1888 (A.D.Lucas, 1910). In 1901 and 1910 he was living at Padwell Road, Southampton. He died in 1918. The family's sojourn in Otterbourne is interesting because this was the home of the successful Victorian children's author Charlotte Yonge. One of her shilling novels was entitled "The Christmas Mummers" (1856), with a storyline built around the performance of a Mummers' play. It is conceivable that they met, and it is possible that Yonge's work later inspired R.C.Lucas to write the fairy story pamphlet that he self-published in 1875. Whether or not Yonge's novel raised the Lucases' awareness of the mumming tradition, it does indicate that the tradition was prevalent in the area around time they were resident there. Richard Cockle Lucas was definitely the more dominant of the two artists. By all accounts, he was very eccentric, believing in fairies, and given to riding round Southampton in a Roman chariot (Southampton City View, 2006/2007). He would undoubtedly have loved and encouraged the Mummers and May Garlands. He was a prolific artist, working in a variety of media. He was most famous for his portrait sculptures, but also etched and sketched, and was an enthusiast for photography. The National Portrait Gallery, for instance has a large set of albumen prints showing Richard Cockle in a variety of theatrical and expressive poses that do nothing to dampen his reputation as an eccentric. Perhaps inevitably, the impression one gets of Albert Dürer Lucas is more sedate. He was very much a painter with an interest in nature. The Christmas and May watercolours therefore differ from his usual themes. He did sometimes assist his father, and may have lived under his shadow. It is not known who took all the photographs of R.C.Lucas. Could it have been his son? It is reasonable to assume that the Lucases witnessed the customs in the pictures themselves, in all probability on multiple occasions. They could have painted the scenes from memory or from life, from a posed group or during the action. The difference between the dates of the scenes (1864) and of the artist's signatures (1900) is puzzling. There are two possibilities. The first is that they could have been painted from memory, in which case there must have been something special about the year 1864 relative to other occasions on which the customs occurred. The date has no obvious significance in the biographies of the Lucas family. It was about then that a new squire took up residency in Chilworth Manor, but it is difficult to see how this might have any connection with these pictures. The alternative explanation is that the paintings were copied or redrawn from earlier works. This seems more likely. The Willis Fleming Historical Trust has copies of several other A.D.Lucas watercolours, many showing local buildings, which also give two dates. This raises a couple of questions. What media were used for the originals? If they were photographs, this would mean that the scenes must have been posed. Could the originals possibly have been his father's work rather than his own? Most intriguingly of all, what happened to the original works? Do they still exist, and if so, where? The newly discovered painting of the Mummers at Chilworth is a valuable addition to our knowledge of mid-19th-century English folk drama. It is one of the earliest illustrations of Mummers that we have, and compares well with later photographs of Hampshire Mummers. It therefore appears to reflect the authentic custom, whereas the contemporary illustrated press tended to publish fanciful reconstructions of Merrie Olde Englande. The likelihood that the painting is a copy of an earlier work raises the exciting prospect that the original may yet come to light and yield further information. I am thankful to Harry Willis Fleming of the Willis Fleming Historical Trust for help with information regarding the Chilworth estate and the Lucas family. I am also grateful to the auction vendor, who asked to remain anonymous, for giving me permission to reproduce his images of the paintings. I thank the members of the Morris Dancing Discussion List for fielding my queries about the taborer, especially Jeremy Kessler and Ally McGurk. Stephen Roud & Paul Marsh (1980) Mumming Plays in Hampshire. 7th ed.